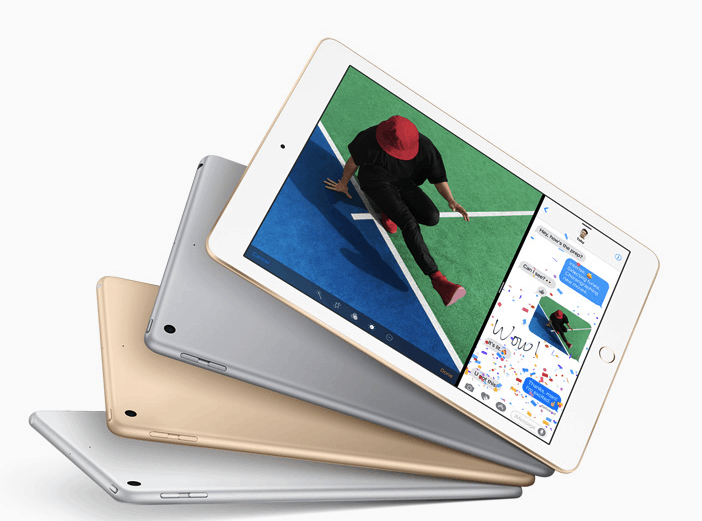 Apple today updated its most popular-sized iPad, featuring a brighter 9.7-inch Retina display at a starting price of $329 (US) which roughly translates to Rs 21,400.
iPad features a bright Retina display with 2048×1536 pixels resolution at 264ppi and is enclosed in a thin aluminum unibody enclosure. It is powered by A9 chip with 64-bit architecture along with the Motion M9 co-processor. The 64‑bit architecture delivers fast processing and graphics performance for apps and games while maintaining the same all-day battery life. Touch ID is embedded on the iPad home button. In terms of camera, the new iPad features an 8MP rear autofocus camera with f/2.4 aperture, 5P lens and is loaded with different modes like Panorama, Hybrid IR Filter, Timer Mode, Auto image stabilization and more. It is capable of recording videos in full-HD (1080×1920 pixles) resolution with 30fps while slow-motion videos can be recorded at 120fps. The Apple 9.7-inch iPad has a 1.2MP FaceTime HD camera with f/2.2 aperture and HD video recording. On the connectivity front, the new iPad supports Wi-Fi 802.11 a/b/g/n/ac, Bluetooth v4.2, GPS, Glonass and LTE bands (WiFi+Cellular). For now, some of the countries that will be getting the new 9.7-inch iPads are Australia, Canada, China, France, Germany, Hong Kong, Italy, Japan, Netherlands, Spain, Sweden, Switzerland and the UK. Apple is also selling the Polyurethane Smart Covers for iPad at $39 in charcoal gray, white, midnight blue, pink sand and (RED) at apple.com and Apple Stores. The new iPad will also be made available in India in April. Apple has also upgraded its iPad Mini 4 and it now offers more capacity for the same price starting at $399 (Rs. 26,000) for the 128GB Wi-Fi model and $529 (Rs. 34,000) for the 128GB Wi-Fi + Cellular model. The new iPad will be available in silver, gold, and space gray color.